The 7th annual Put-in-Bay Road Races Reunion — Monday, August 31 – Wednesday, September 2, 2015 — will feature an expanded race program this year with racing at the historic Put-in-Bay airport on two days rather than one, as in the past. 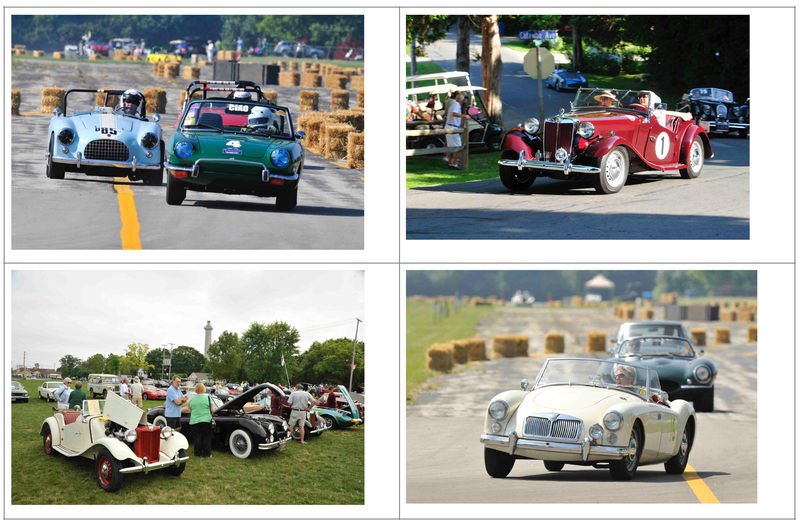 Much more than just a vintage race, the Put-in-Bay Road Races Reunion (PIBRRR) also welcomes owner-drivers of non-racing vintage sports cars of all types to come and participate in various events and activities. Featured marques this year include MG and Turner, with healthy turnouts of both types of cars expected as the PIBRRR is featured on the 2015 “Featured events calendar” of the MG Vintage Racers and is once again the official venue for the annual USA Turner Reunion. Jack Woehrle, race director of the event since the founding of PIBRRR in 2009, says he is excited not only to be able to expand the amount of track time for the racers but to also offer a significantly upgraded racing surface thanks to recent repaving and an added taxiway. “Besides the airport upgrades, we are also very fortunate that the entire Put-in-Bay community has embraced this event and are making things happen that will help ensure its continued success in the future as well as add to the enjoyment for all participants,” said Woehrle. Beginning with a small event in 2009, the Put-in-Bay Road Races Reunion celebrates sports car races that were held at Put-in-Bay on Ohio’s South Bass Island from 1952 to 1959 and in 1963. The steadily growing, three-day reunion engages participants in an event that reaches back in time to capture the history and re-create the atmosphere of sports car racing of that era in a uniquely beautiful setting. So wrapped around a day and a half of small-bore sports car racing at the island’s airport is a balanced mix of events honoring the island’s racing history, a few social gatherings, a car show, original course and airport-track touring, rocker cover races and plenty of unstructured time as well. Put-in-Bay is a nostalgic island enclave and a short ferry ride off the shore of Lake Erie near Sandusky, Ohio. A summer resort community little changed from the ‘50s, it is one of the very few places in North America where post-war sports cars raced through towns and countryside on public roads and where those roads exist today virtually unchanged. For PIBRRR details see the racecar eligibility form, registration form, general race rules & regulations, preliminary event schedule and other information under the registration section at www.pibroadrace.com. Note: $100 discount for registrations received before May 1, 2015! $50 discount for entries received between May 2 and August 1. Sunday, August 30 – Registration opens. Welcome party. Monday, August 31 – Morning focuses on PIB Road Races History featuring historic PIB racing presentations and guests. In the afternoon on-your-own island touring is available for all while racing orientation and practice sessions commence at the airport after lunch, followed by late afternoon laps of the original course. Hangar party follows racing and original course tour. Tuesday, August 26 – Race Day 2 at the Put-in-Bay airport! Featuring several classes of race cars and track touring for non-race participants. Racing awards party following. Wednesday, August 27 – Car Show Day, followed by farewell luncheon and car show awards presentation including presentation of The Paul Henry Award.